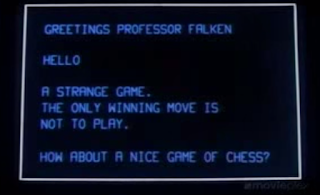 Well, the reference to 'winning Eve' equating to not playing Eve comes from the Movie WarGames. That particular movie came out in 1983. While alive, I was quite young and not watching television. By the time I was watching television I was a bit older and I was more interested in books then eighties movies with over acted children in them. But all of these 'wining Eve' references made me go look at it. I find the entire quote usage to not sit well with me. There seems to be a bitter sarcasm to the entire thing. However, I also know that I'm not filtering it through the movie correctly. So, I might as well do some research. The quote is a popular one. I started to type it into google and google knew just what I wanted. It is easy to pull one line from something and spin it into other things. I do see how this line can be spun into Eve's endless gameplay that molds and twists as you grab and work with it. It refuses to end. It refuses to stay in a particular mode. But, I still couldn't equate leaving with winning. And, as I often do with words that don't sit well with me I wandered to the dictionary. I do love language but even common words can be much deeper then we expect them to be. And in that, I found an answer that made me go, "Oh." There are more. But tucked in the simple definition of the word win was an answer. If they've reached their place, made their success, and found themselves past that point they wished to be then they have indeed won. It is something to think over. While I started writing with one thought I've arrived at another. As someone who struggles, deeply, with this type of concept my little escapade into research has left me to think about some other things. And if people want to see their leaving the game as a win, I understand it a bit better. That we Eve players could dare each other to quit (and we commonly do just that) speaks volumes about how deeply appealing this game we play is. Like yourself, I was never comfortable with the expression and thats exactly why I used it as a title for my blog post. 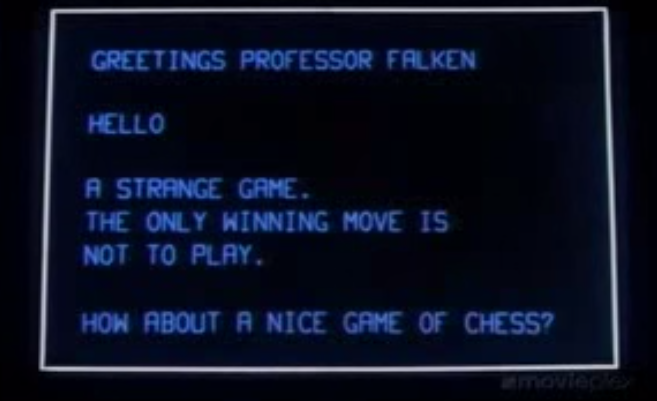 But I didn't know it came from "Wargames", in my view, "Winning" implies overcoming adversity and in EVE context, addiction to the game. Quitting EVE is like quitting smoking, its easier to quit cold turkey than reducing the consumption gradually. I hate the times when I am not active, not involved, not motivated... it is, for me, not a Win... but a very real loss. Looking at the PCU count on Chribba's site, more and more people are winning at Eve. Thank goodness for the goons helping so many more people to win Eve after this past weekend. The concept of Zugzwang has been around for a long time. In my opinion of you're playing eve and enjoying yourself you're winning eve. If you aren't enjoying yourself or if your hobby is negatively impacting your life and you quit then you also won eve. This applies to most things in life.